At Carleton, we believe experiences outside the classroom are vital to a student’s development and growth. We believe these experiences instill in students a sense of purpose and of global responsibility, both of which continue to shape their lives long after they graduate. Over the next six weeks, we’re featuring stories from students and recent grads on the experiences they had at Carleton that forever changed their futures, and the moments they realized that they, along with all of us here at Carleton, are Here for Good. I’m a firm believer that if I have the opportunity to help someone else out, then I should take that opportunity. I’ve felt this way as long as I can remember. As philanthropy is one of my biggest values, it’s one of the primary reasons I came to Carleton. Since becoming a student, I’ve been involved in a number of organizations, from student government to a fraternity to helping run a Movember campaign. Amidst all that, though, I always felt like I needed something more. When I applied for the Alternative Spring Break program and was assigned to the Guatemala team, I’ll admit it – I didn’t really know what to expect. I knew we were tasked with helping another organization (Students Offering Support, or SOS) build a multi-purpose sports court for a small mountain community, so I figured it would mainly be a labor-strict project. In reality, the trip was so much more. When the time finally came, I flew with 15 other students and SOS employees into Guatemala City before hopping on a bus for nine hours to a small rural community in the Guatemalan mountains. As such a remote area, the community felt there wasn’t a safe place for local kids to play, so locals had submitted a proposal to SOS for a multi-purpose sports court to be built so their children would have a safe place to enhance their mental and physical health. Besides working with a local construction crew to lay cement and put up goal posts, our experience was more of an immersion into another culture: We ate what they ate, and we lived like they lived for the entire week. We spent time with kids learning what they do and how they live, learning about their culture and getting tours of the local neighbourhood right beside the school. One experience I’ll never forget happened halfway through the week. We were taking a tour of the neighbourhood around the school, and a child walked around with me holding my hand while I taught him how to take pictures on my camera. Near the end of the tour, he pulled me towards a house – his house. He pulled me into a small two-room house made of sheet metal, and in the kitchen, on this tiny little table, was a little bit of food and water put out for dinner. Despite having little to spare, he wanted me to eat with his family! I politely declined (though his mother insisted I take some fruit). A few hours later, I saw the child again playing with his friends. I slipped him a coin (about 20 cents Canadian) to buy some candy from this little canteen, and he quickly bought a bag of chips. When he came back out, I knelt down and asked him what he’d bought. Instead of showing me, he opened the bag of chips, and he handed one chip out of the bag to each of the members in my group to the point that he had one chip left in his bag. He ate it with a grin on his face, and then he simply walked away. It’s amazing what you can learn from anyone – even a child. And if a 6-year-old can show such compassion, then we have an even bigger responsible to do the same. As university students, we set out to have an impact on a community or with other people, to go make an impact or a change somewhere in the world. And as much as that was our intention, the influence the experience and this Guatemalan community had on us was a lot more profound than what we had on them. I came back with a much deeper understanding of philanthropy, a much different perception of culture and society, and I’m forever changed because of it. 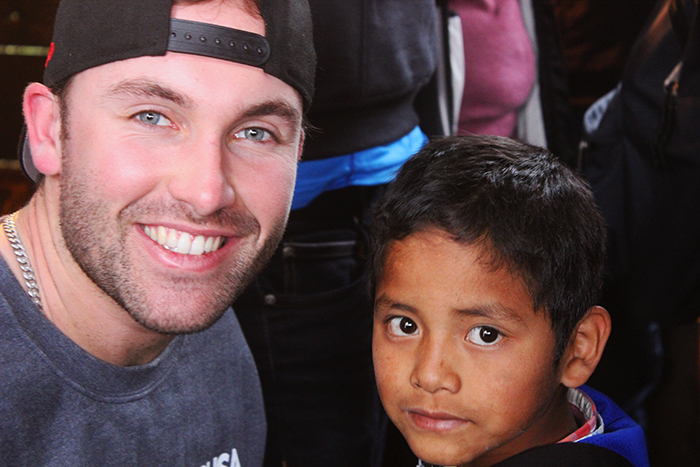 Because of that 6-year-old boy in the mountains of Guatemala, I now understand what it means to be Here for Good. Here for Good means that we have a responsibility to help others, whether in Ottawa or across the world. Experiences like Alternative Spring Break instill in students like me what it means to make a difference for others, and how any act – big or small – can have a lasting impact on the world around you. Not every student is financially able to fund such experiences, and that’s why support from donors like you is so important, and so appreciated. Your support of student experiences like Alternative Spring Break isn’t about giving a student the chance to travel; it’s investing in the development of their skills, careers and capacity for giving back. It teaches students like me how to incorporate philanthropy into all aspects of my life, and it underscores what it means to be a citizen of the world. Make your own impact by helping a student become Here for Good today. Student experiences at Carleton aren’t just about doing good for one period of time – they are designed to cultivate the desire and capacity to continue doing good well into the future. These important experiences cannot be possible without the support of donors like you. When you support experiences for Carleton students, you aren’t contributing to a trip or a project: You are investing in the future of Ottawa, Canada and the world, making it possible for the next generation to do more good. Be a Future Funder and join us in being Here for Good today.